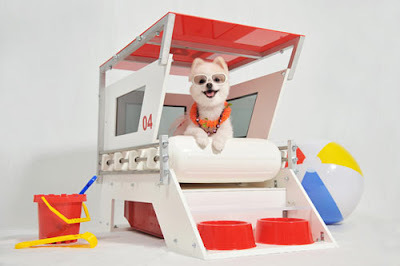 The White Dog Blog: Surf's up, puppers! Oh, my dog. Don't you just LOVE this dog house???? It's a lifeguard stand. I can't stand it!!! Surf's up, puppers, and I am on guard to protect you!! It's made by Unleash Studio and we first saw it here on Dog Milk. If you click over there, you can see the house from lots of other angles. Love it, love it, love it. Every now and then we run across something we think is just PERFECT. Just wish I could have been the model!!!! THAT would have been perfection. It really suites you!! Very cool and trendy! What a fun dog house! Looks like a fabulous house to hang out in!! That is great! May have to try building one.